“Big Feet” is a new stone sculpture in my series of winter animals–another beautifully graphic statement in light and shadow. 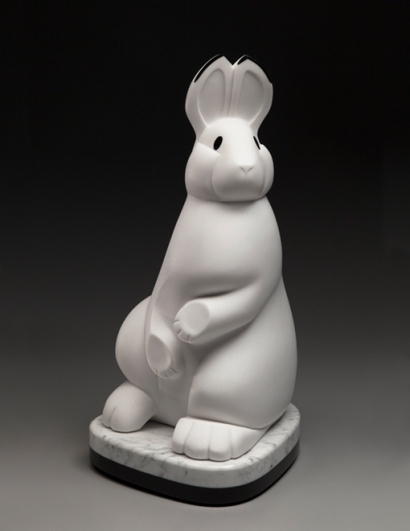 The snowshoe hare, aptly named for its very large hind feet, is built for winter survival. It trades in its brown summer coat for thick, pure white fur in winter. Its black ear tips do not change color and serve to confuse pursuant predators. Its black eyes act like sunglasses filtering out UV rays. Its enormous hind feet act like snowshoes in deep snow, allowing the hare to zip over the surface of the snow. The snowshoe hare is a foundation species of the northern boreal forest–a nice way of saying every predator in the forest eats the snowshoe hare. It is one of the original fast foods. Speed and camouflage are the hare’s only defenses against predators. I learned from my research that snowshoe hares do not dig burrows like rabbits, but find shelter in dense brush or fallen trees. They eat twigs, leaves, bark, needles, grasses, and wild flowers. If forage is abundant, the snowshoe hare produces 3 litters of up to 8 leverets (baby hares) each year. The leverets are born with a full coat of fur and open their eyes soon after birth. They remain with their mother for only a month, and are then capable of taking care of themselves. Their average life span is 1 year (maybe 2) if they can survive the first 6 months of life. Snowshoe hares are the most important prey animals of the lynx, an endangered northern wild cat. In fact, the snowshoe hare is so important to the survival of the lynx that lynx populations rise and fall with the fluctuations in snowshoe hare numbers. The forest is an inter-connected series of dynamic relationships.